(NewsUSA) - Family businesses, large and small, are vital to the US economy. However, few family-owned businesses make it to the third or fourth generation of family ownership. CK Mondavi and Family has been successful because of its excellent quality, great value and family heritage. It's also a family wine business remains committed to remaining family-owned even after almost seventy-five years. Today, the third, and now fourth generation family members are now at the helm of this US wine legacy, leading this wine brand into the future. "CK Mondavi and Family wines are a tradition that has been in our family for four generations," says 4th generation Riana Mondavi. "Passion has kept our family business going and I can say for all of us in this next generation, we are extremely humbled to carry on a wine legacy that was started by our great grandparents so long ago. We are also wholeheartedly committed to continuing the Mondavi family tradition for generations to come." Riana and other "G4" family members including Alycia Mondavi, Angelina Mondavi, Giovanna Mondavi, Lia Mondavi, and Lucio Mondavi, are continuing to steward the family's winemaking institution as official brand ambassadors, the major shareholders of their family business. Two G4 members now serve as representatives on their Board of Directors. Their fathers, Marc Mondavi and Peter Mondavi, Jr., remain co-proprietors of the company, but this next generation of cousins is now more involved in the direction of the business. CK Mondavi and Family was started by their great grandparents, Cesare and Rosa Mondavi, Italians who turned a mid-western grape-shipping business into a wine legacy. Eventually, the G4's grandfather, Peter Mondavi, Sr., took over the family business and continued to work tirelessly to ensure the business would be around for generations to come. Today, they continue to honor their grandfather's legacy in everything they do. 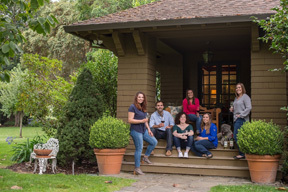 All of the G4 grew up on and around their family's Napa Valley estate, learning the business from a very young age. They played tag in the vineyards, picked grapes at harvest, worked in the cellars, and came to love their family business. It's no wonder that they are now playing a larger role and are being groomed to steward the company in to the future. Each member of the "G4" brings his own approach and expertise to the business. Their collective expertise encompasses a range of talent and skills that will benefit every part of the family business - winemaking, management, engineering, finance, marketing and sales. This next generation remains committed to continuing to produce consistently delicious everyday wines from grapes that are 100 percent sourced from California vineyards, and sustainable farming techniques and winemaking practices that are more typically found with expensive wines. They are the first and only wines that are 100 percent "Made in USA Certified." The G4 members of the iconic Mondavi family are in place to move the company forward while ensuring best wines and best practices with each bottle that carries their name. You can find them online at CKMondavi.com, or on Twitter, Facebook, Pinterest and Instagram @CKMondaviWines.